In this final Splatfest Analysis, we will be taking a closer look at the distributions of the 9 games I had with the Splattershot to determine whether its consistent place in the top 3 was due to me consistently playing well with the weapon, or whether the averages were skewed by particularly high leverage outliers. 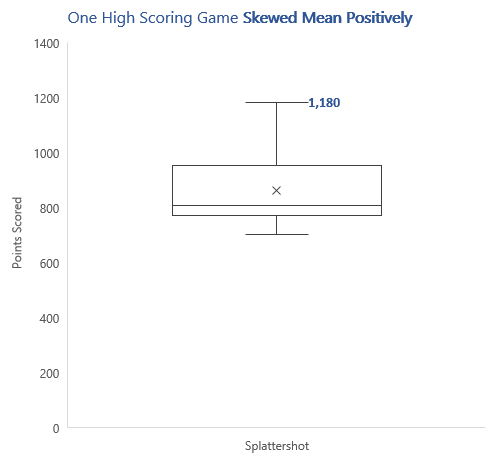 The points scored with the Splattershot were relatively consistent around 800-900, but a particularly good game where I scored 1180 points has skewed the mean positively, but it wasn’t so dramatic a swing to cause the mean to drift far from the median; it was near where most of the points were clustered. The number of kills I got each game with the Splattershot were also consistently around 5-6 kills each game. 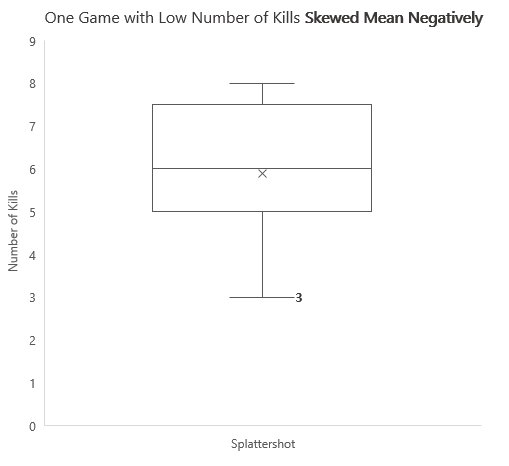 A slightly low game with 3 kills did cause some skew negatively to the mean, but again it stayed close to the median and where most points were clustered. 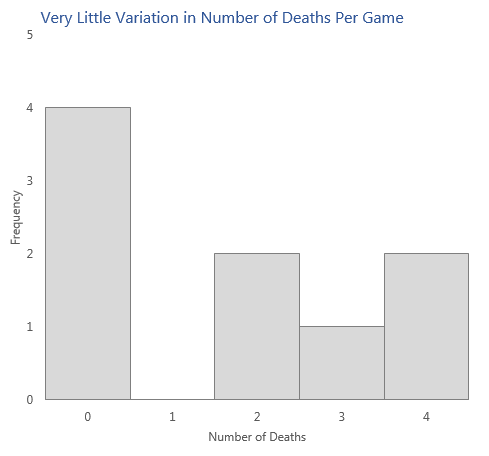 The number of deaths each game also showed very little variation, with the most frequent number of deaths being 0. It ranged from 0-4 with a fairly even spread, meaning no individual point had a particularly large influence on the mean of 1.67. In conclusion, it does seem that I was consistently good with the Splattershot – meaning it was well deserving of its top 3 positions despite its lower sample size. Box and Whisker Plots in Excel 2016 are fickle and I’ll likely avoid them in future! A more heavily annotated set of graphics may have been more suitable, instead of writing up everything in these report-style blog posts. This would allow the analyses to better live as separate entities from this blog, which is especially important when doing analyses of sensitive data to make sure the data can’t easily be divorced from the analysts’ findings and any caveats to the data. Using Excel to do ‘proper’ data analysis with the AnalysisToolPak is very easy. Until starting this I was unaware Excel could do things like linear regression (almost) natively, usually I would move my data over to a more specialised analytical software package like SPSS (and I have a particularly large disdain for SPSS!). Thanks to those of you who took the time to read my ramblings and please don’t be afraid to leave any feedback you have in the comments section. Here is the Excel file I used to create all of the graphics for this analysis: Link.